As the UK’s premier taxi advertiser, we specialise in bringing colourful campaigns to the streets of the British capital on this exciting and dynamic advertising format. With 8.6m people to target in the area, London Taxi Advertising can drive your brand to success in style. See your brand on the famous hackney carriage – an iconic London attraction! The world’s most powerful financial centre – reach an affluent audience! 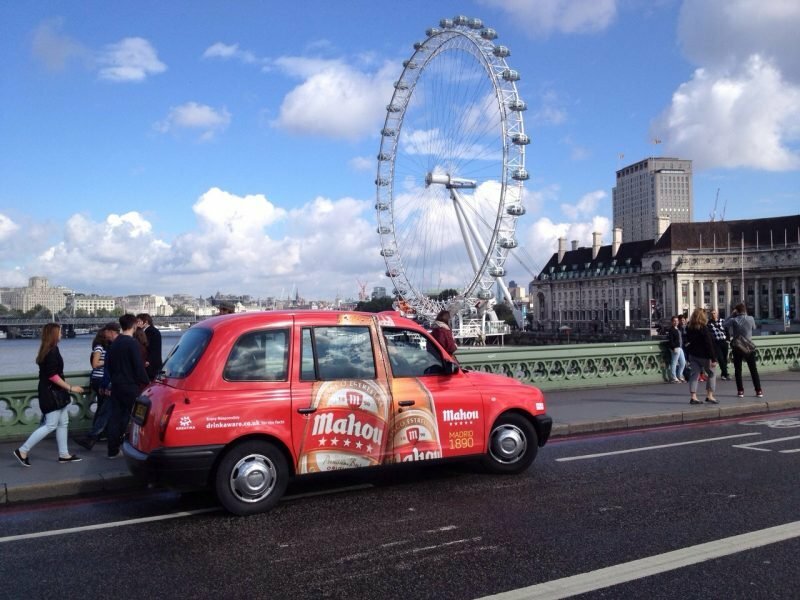 London cab advertising presents brands with unrivalled reach as this famous symbol of British cultures travels around the busiest areas of the capital. 98% of people agree that the black taxi is an iconic part of the urban landscape – and it could be showcasing your brand! With a range of fantastic ad formats to choose from, London Taxi Advertising is your number one choice for a black cab campaign in the famous city of London. One of the world’s most popular tourist destinations, London welcomes 17.5m visitors from overseas each year thanks to countless tourist attractions, hot-spots and famous landmarks such as Buckingham Palace, Big Ben and the London Eye – not to mention the iconic black cab itself. Known as the most powerful financial centre in the world, London boasts a working demographic which is 78% ABC1, with 25% of all the UK’s managers and professionals working in the city. London also has an above-average level of millennials living in the city, with 43% of Londoners aged between 20-44. Financial districts such as Canary Wharf and the City of London are home to the headquarters of powerful businesses and banks, such as BT, Lloyds and the London Stock Exchange. Taxi advertising can reach this invaluable audience. Interior formats such as tip seat ads can drive instant engagement with this high-end audience – London has the highest number of smartphones in the UK market, with passengers able to get online instantly should your advert catch their eye.